Big eyes, long tentacles, dangling little legs -- it could be a shrimp or a krill. Both are crustaceans, but belong to different orders. Shrimp are the Natantia suborder of the Decapoda order; krill are of the Euphausiacea order. There are approximately 85 species of krill and more than 1,900 species of shrimp. The first way to distinguish krill from shrimp is to look at their bodies. Krill are comprised of three segments, the head, thorax and abdomen. The thorax and abdomen are covered by the carapace, a protective shell. Krill have two antennae and several pairs of "legs" in the thoracic region, varying according to species. They're basically translucent, though pigment spots give krill a red tinge. They range from 1/2 inch to 6 inches long. Shrimp have two parts: a cephalothorax, which is a head fused to a thorax, and the abdomen. The cephalothorax is a complex bit of business: it holds a pair of compound eyes, two pairs of antennae, a pair of jaws, five pairs of accessory jaws and five pairs of legs. The accessory jaws help shrimp grasp, swim and bite. The abdomen of a shrimp has a lot going on too; it has five pairs of swimmerets and a pair of uropods, used for swimming, and a tailpiece. When you eat shrimp cocktail, the tail fan you're holding onto is the uropods and telson. Like krill, shrimp are covered by the carapace. 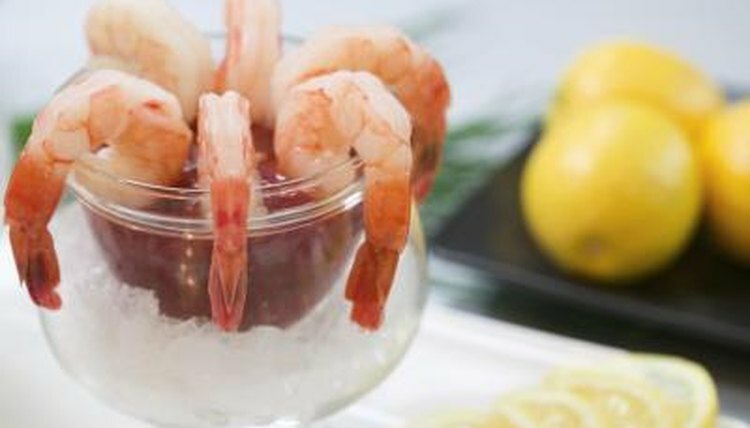 Shrimp can be as small as less than 1 inch in length to more than 12 inches long. Female krill can lay thousands of eggs through the year. Whether they carry the eggs or drop them for hatching depends on the species. Shrimp can lay up to a million eggs in one session. The difference in volume may be connected to their expected lifespan. Krill can live far longer than shrimp, enjoying life for up to 10 years. Shrimp have a far shorter lifespan, maxing out at about two years. The large volume of eggs allows shrimp to thrive, despite their short lifetime. Shrimp are omnivores and eat by sifting through the ocean floor's sand or filtering the water to ingest tiny particles of plants and other animals. Most of their diet is comprised of plankton and algae. Krill are herbivores, dining on phytoplankton, which are single-celled plants on the ocean's surface, as well as algae. Both creatures are important in the food chain. Krill are a diet staple for hundreds of animals, including baleen whales, birds and fish, and are considered crucial to many life forms in the Antarctic. Shrimp are also an important part of the food chain for a variety of marine life, including dolphins, whales, fish, crabs and sea urchins. Both krill and shrimp are threatened. The primary danger to shrimp is overfishing; however, they are also losing habitat to drilling, oil spills and pollution. Krill stocks have declined by large numbers in the Antarctic, as ice loss removes the major food source of ice algae. As krill stocks in the Antarctic disappear, there is concern about the impact on the other animals relying on krill for nutrition. National Geographic notes that without krill, many forms of Antarctic life would disappear.